We would like to know what you think about recreation opportunities on Starker Forests lands. Starker Forests, Inc., a family-owned forestry company based in Corvallis, is pleased to celebrate our 75th Anniversary during 2011. Our founder, T.J. Starker, bought his first forestland parcel in 1936. As part of our recognition of this milestone anniversary, we will celebrate with a public open house at our office at 7240 SW Philomath Blvd., on Saturday, July 23, from 10:00 AM to 5:00 PM. In addition to visiting our office, a 2 1/2 hour tour to the Starker Forestry Trail near Blodgett will be offered. The trail is the site of T.J. Starker’s first forestland purchase. Since that first purchase, Starker Forests, Inc.‘s ownership has grown to about 80,000 acres of productive forestland in five western Oregon counties; Benton, Lincoln, Polk, Lane, and Linn. Our business is sustainabe management of our forestland to produce commercial timber for use as raw material in the wood products industry. Starker Forests, Inc. employs 20 people and provides indirect employment for an additional 250 to 300 individuals in other busineesses, many of which are local and family-owned. In addition to producing logs for lumber, plywood, and paper manufacturing, our forestland provides excellent, diverse habitats for all kinds of wildlife and an assortment of recreational opportunities. Our open house will provide a chance to learn how we manage our forests and how to use our forests for recreational activities. We grow forests – not just trees. Gary Blanchard is celebrating 50 years as a forester with Starker Forests. Gary graduated with a Forest Management degree from OSU in June of 1961 and immediately began working as a full time forester at Starker Forests. Gary first started working for TJ Starker in 1958, as a student, and called himself a “general all around flunky”. He recalls helping TJ in his nursery, planting trees and running lines on weekends and during the summer. Those of us who know Gary today would call him anything but a flunky. 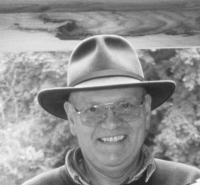 In fact, he is one of the first people we ask if we have a question about the history of a particular site in the forest, the story of a person who has long since passed away, or want to know about current trends in gardening or fishing on the Alsea River. Gary was our Chief Forester until 2007, when he decided to switch to working half time and focus on a community history project. As Chief Forester, Gary was responsible for overseeing all forest management and harvest activities on Starker lands. Gary and his wife, Marlene, have been married 53 years and have three daughters and three grandsons. For those of us that work with Gary, we are thrilled that he has not yet decided to fully retire. He is a good friend and mentor to those in the forestry community. Congratulations Gary on 50 years with Starker Forests! 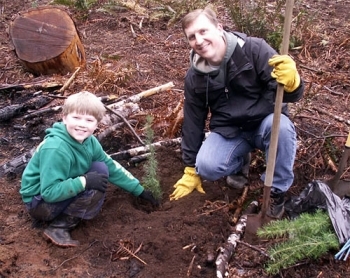 Kids of all ages gathered on a Saturday in February for Starker Forestsâ€™ 20th Annual Tree Planting Day. With shovels and rain boots, 140 children and their parents participated in the event, designed to be fun and teach more about forest management. 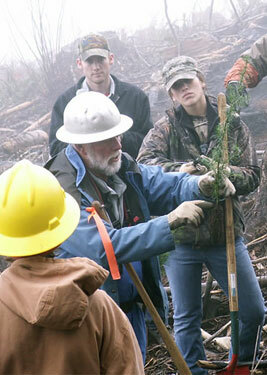 The event, organized by the Philomath High School Forestry Club, was completely free! After planting, participants got a T-shirt, hot dogs and hot chocolate. Boy Scout Troop 2, Explorer Post 122, Oregon State Universityâ€™s student chapter of the Society of American Foresters and the Benton County Sheriffâ€™s Office also helped to sponsor and organize the day. Next yearâ€™s Tree Planting Day takes place in early February. Watch for more details!